This post is not sponsored by YNAB. I just love their software. The beginning of a new year means the beginning of a new financial year, at least to me. I love looking back on my finances for the past year and setting goals to improve in the future. I am happy to announce…. …I paid off over $14,000 in debt in 2015! $14,697.53 to be exact. All while making $23,000 a year (gross income) from my main job and another $3,000 (net income) from my part-time job. You’ll notice that the graphic says January 2015 through January 2016, but since I have a “buffer” of a month’s pay in my checking account, and therefore live off last month’s income, the January 2016 money that I applied toward my debt was paid in December. I am just a little over $6,500 shy from being totally debt-free, but I’ve decided to put my debt-free journey on hold to save for a wedding 😉 Andy and I will therefore conquer my student loans as a team after we are married and we’ll get to do our Debt Free Scream on the Dave Ramsey show together. Oh yeah and also…. I paid off my credit card!!!! 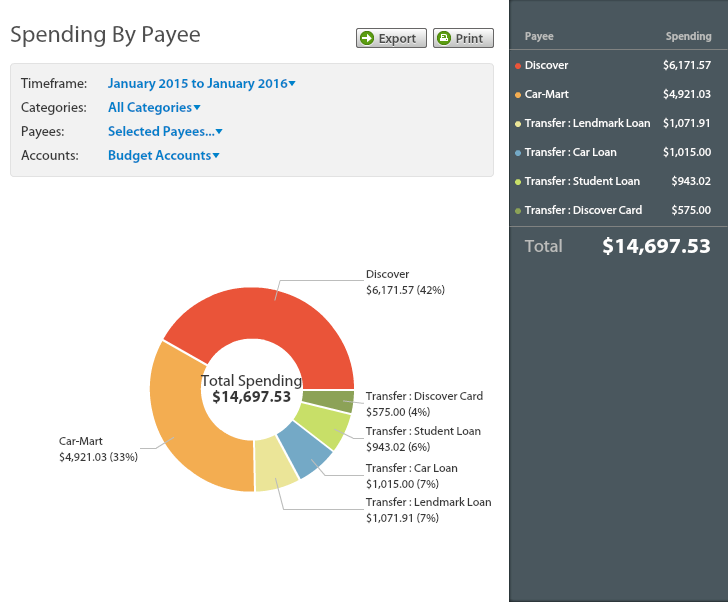 I am Discovering what no credit card debt feels like, and it is A-MAZ-ING! I plan to continue using my card, but pay it off in full each month. One of the things that was huge in my debt-free journey was You Need A Budget (YNAB) software. It has revolutionized my budgeting! Instead of doing the cash envelope system each month, I can have virtual envelopes tied right into my account register. No more keeping a checkbook! I can also pull reports to see where my money has gone…. and it just takes a click of a button! I love YNAB so much I wish I could give each and every one of you a copy. Alas, I did not win the Powerball, so just take my word for it and do the free trial!